The Assam Higher Secondary Education Council (AHSEC) has released the HSE/Class 12 Examination 2017 today. In 2016, the AHSEC HSE Exam was held in February and March. The AHSEC HSE Class 12 Exam 2017 is going to begin from 20 February 2017 and end on 20 March 2017. 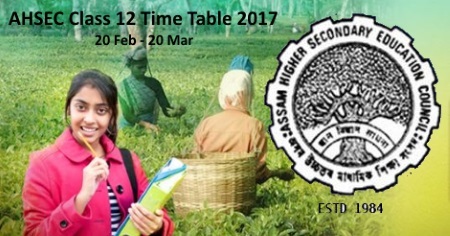 The Assam Class 12 Exam 2017 will be held in two sessions, i.e. Morning and Afternoon. The morning session is going to begin at 9am and end at 12 noon; while the afternoon session will start at 1.30pm and continue till 4.30pm. All students are requested to check the dates thoroughly. The HSE Class 12 Timetable 2017 given below is the final one. Keep a tab on this space for more information regarding any more inform AHSEC Class 12 Exam 2017 and for further updates keep checking the website. AHSEC HS 12th Result 2017 will also be made available on this website. Click here to check your result. Papers on Modern Indian Language Subjects/Alternative English and English of this Stream are same as those of Modern Indian Languages / Alternative English and English of the HS Final Examination [Arts/Science/Commerce Streams]. A candidate under this stream may offer either Modern Indian Language Subject/Alternative English or English. However, a candidate may offer both the MIL subject/Alternative English and English and in such case, the marks secured by the candidate in one of the Language subjects [in which his/her performance is better] will be taken into account.